With help from XPB Locker Supply, you can save space in your small restroom without sacrificing accessibility, privacy, or comfort. The biggest challenges face those who are remodeling their restrooms and planning to replace only a portion of their existing fixtures. Or, they may have ordered fixtures from different vendors, and things such as the lavatory system they purchased represent fixed dimensions that cannot be altered. Other areas of the room, such as stall placement, stall size, urinals (if renovating a men’s room), and urinal screens are the products that have to be relocated or adjusted in size to fit the existing square footage of the room. It may also be necessary to re-position certain restroom elements in order to make everything fit. The first step in this process involves getting a copy of the blueprints and checking for correct measurements. We can normally see, very quickly, where different sections of the restroom can be altered to increase floor areas and distances between walls. In most cases, two basic challenges face us that we have successfully worked around in a number of projects in the past. The first challenge typically involves insufficient area between the vanity area and the far end of the restroom. There simply is not enough room, in some small restrooms, to put a row of stalls (and urinals if a men’s room) between the vanity and the wall. 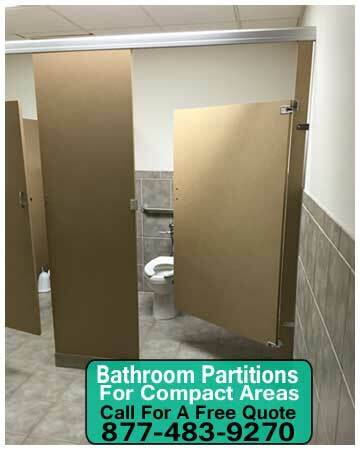 Rather than compromising the number of stalls, or violating ADA codes, we may recommend placing the ADA restroom stall along the far wall itself, and positioning the other partitions and urinals differently so as to fit between the vanity area and the end of the room. This solves the problem of saving space when the length of the room may not be enough to accommodate all that is specified. But what do you do when the room is too narrow to build partitions out from the wall without crowding restroom occupants? In these settings, we may need to alter the sizes of the stalls themselves in order to make the stall depth better fit the overall width of the room. In some projects, we have reduced partitions width as much as 48 inches to create an enclosure that was functional and private, but that also allowed us to save space between the stall and the wall. In some small restrooms, the accessories inside the stalls made in swinging doors impractical, so we further customized the partitions with doors that swing outward, allowing for larger, multi-function dispensers and other amenities to be fitted to stall interiors. XPB Lockers carries a wide variety commercial industrial sinks, commercial bathroom equipment, commercial outdoor furniture, bleachers, and industrial warehouse equipment delivered nationwide. If you can not find what you are looking for call us toll free at 1-877-483-9270 and we will find it for you. Our home office is located in New Braunfels, Texas with warehouses located throughout the United States that enable us to service all 50 states Including Houston, San Antonio, Corpus Christi & Dallas Texas.